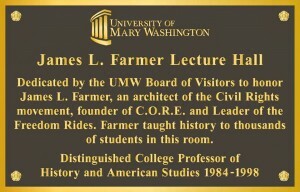 I was honored to be asked to be part of the dedication of the large lecture room in Monroe Hall at UMW in honor of Civil Rights icon James Farmer, who taught in that room for nearly 15 years. Here is the text of my remarks with some of the clips I shared with the audience. Thank you all for coming. It is indeed an honor for me to be here today, to be part of this ceremony. And it’s certainly appropriate for me, as chair of UMW’s department of History and American Studies, the department that James Farmer taught in for many years, to say a few words here today. But I have another perspective on Dr. Farmer as well. Twenty years ago this fall, I was starting my senior year at Mary Washington College, and, once a week, for nearly three hours, I had the privilege of sitting in this very room, listening to James Farmer tell nearly 100 of us about the Civil Rights movement and about his role in it as part of his Introduction to Civil Rights course. As a history major I had heard about the movement in several of my classes, but there was something fundamentally different in hearing those stories come to life from someone who had been there, someone who had physically and emotionally suffered for the cause in which he believed. As a history major who had every plan of going on to graduate school to become a professor, a scholar, an historian, a teacher there was something deeply powerful about hearing from a living legend who was simultaneously, clearly human as well. He was self-deprecating and open about his personal struggles: discussing, for example, how he dealt with his jealousy of “Martin’s” fame (that first-name reference itself a casual, not ostentatious, but constant reminder to us of his ties to the other leaders of the movement) or his wondering whether he made the right decision to stay in jail with other protesters arrested in Plaquemine, Louisiana instead of paying the fees and being at the 1963 March on Washington. Even if I hadn’t already been aware of the unique experience that I and my classmates were going through, it would have been brought home to me when I got my paper back with his comments on it. My paper was on Lyndon Johnson’s varied stances on Civil Rights over the years. I won’t bore you with the details now, but I was proud of the nuanced story that I had written, working in many primary sources, but especially using LBJ’s autobiography, written after he had stepped down as president. [In retrospect, given what I know now of primary sources and about Lyndon Johnson, I bought into LBJ’s retellings of his own story more than I should have.] When I got the paper back, Dr. Farmer had simply written, “Interesting. This is not the version President Johnson told me when I was in the Oval Office.” Now, I’d had professors tell me that I needed to think more critically about my sources before, but none of them could cite actual interactions with the people in question to make me do so. For this and so many other reasons, my time in James Farmer’s class, my time in this very room with him, was transformative, so much so, that when I had the chance to come back to teach at Mary Washington I jumped at the opportunity to find ways to remember and honor him, for his service to the Civil Rights Movement and for his service to nearly a generation of students at this school. I’m not alone in that. Tim O’Donnell taught a First-Year Seminar on James Farmer, as do an interdisciplinary group of faculty led by Craig Vasey; my colleague Jess Rigelhaupt taught an oral history class in which the students interviewed many of Farmer’s colleagues during his time at MWC. But I’ve been asked to show you a bit of work that students in my digital history courses have done to honor James Farmer. Now, in talking with my students who were working on these projects, I told them about my own experiences in Farmer’s class and about his many gifts as an orator. They decided that they wanted to make it possible for others to not just read Dr. Farmer’s words but to be able to hear him as well. The 2008 iteration of my digital history course found and digitized Farmer’s 1994 appearance before the Federal Election Commission. There are many excerpts of that testimony with him talking about his first exposure to racism in 1923, him discussing his views on affirmative action, him revealing the ways in which Gandhi’s non-violent approach was an inspiration to him. But I want to share this clip of a poem that Farmer himself wrote. In the mid-1980s television station WNVT came and recorded 13 of James Farmer’s class lectures. In 2012, working with our Division of Teaching and Learning Technologies, students digitized those lectures, transcribed them, and made them available for anyone to see. I want to share two clips here. The first clip is actually a trailer made for the site by the students in the class to draw people in to watching the full lectures. In the second clip Farmer talks about what he saw as the successes of the Freedom Summer. Please check out these two sites for more videos of Dr. Farmer’s FEC testimony and class lectures. So you can see that through the work of UMW students everyone can hear James Farmer’s words, can hear him tell his stories, can come to understand why we honor James Farmer today with a room in which people will regularly gather to hear from faculty, from guest speakers, from politicians debating the issues of the day, and from students presenting on their own research, perhaps on the Civil Rights Movement. 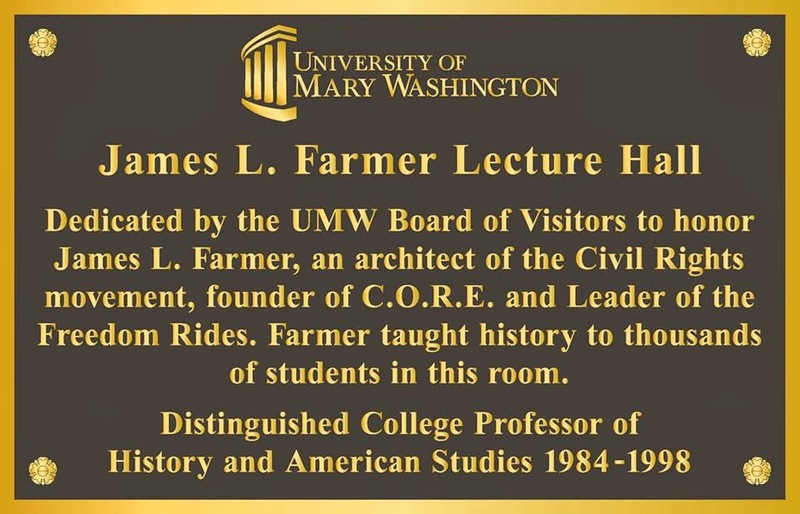 It is indeed right and appropriate that today we honor James Farmer in this way, in this room in which he touched so many Mary Washington students’ lives. It is indeed right and appropriate that we celebrate and recognize the life and teaching of James Leonard Farmer, Civil Rights leader, hero, and educator.